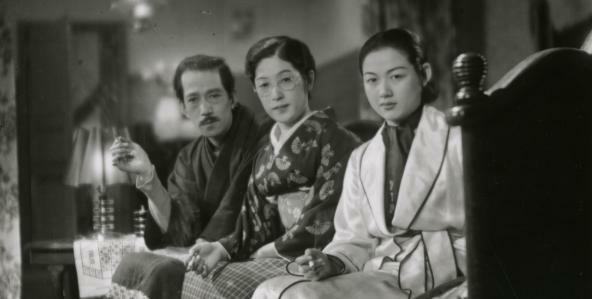 This month I'm going to be making a big push to see several not-on-DVD films directed by Yasujiro Ozu which are available on the FilmStruck streaming service. FilmStruck is being shut down by AT&T/Warner on November 29th, so I have a little less than a month to catch as many titles as possible. The FilmStruck shutdown, incidentally, continues to be the talk of classic film circles on social media. At this writing a petition asking AT&T/Warner not to kick the beloved service to the curb has passed 17,000 signatures. It seems unlikely this will change the minds of a company which doesn't want to focus on smaller "niche" services but it's good to see so many people rallying behind classic film. WHAT DID THE LADY FORGET? is a relatively short Ozu film, clocking in at just 71 minutes. 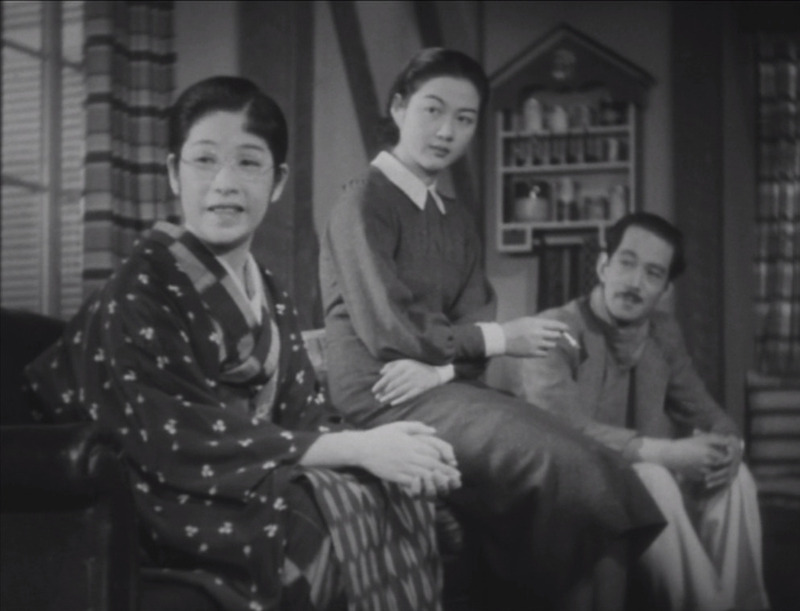 In this story written by Ozu and Akira Fushimi, a well-off medical professor, Komiya (Tatsuo Saito), and his wife Tokiko (Sumiko Kurishima) host her strong-willed niece Setsuko (Michiko Kuwano) for an extended visit. Setsuko persuades her uncle to skip a day at the golf course and take her to see a geisha house. After the night out, the uncle ends up sleeping at the home of his assistant, Okada (Shuji Sano), who also delivers Setsuko back home. When uncle and niece attempt to prevent his bossy, suspicious wife from hearing about their "unauthorized" excursion, things go from bad to worse as they are caught in lies. The movie was a bit slow to get going as the characters sorted themselves out. I didn't realize at first that the very young-looking girl in glasses was the professor's wife! As the characters and relationships become more defined, the film takes off and becomes more enjoyable. The main theme, with a childless husband and wife taking each other for granted and annoying each other, before finally realizing how much they care for one another, was also reflected in the last Ozu film I saw, FLAVOR OF GREEN TEA OVER RICE (1952). FLAVOR OF GREEN TEA OVER RICE was made 15 years later, yet there's a strong thread between the two films. Each movie's final scenes with husband and wife, as they come together late at night, are lovely, and in the case of WHAT DID THE LADY FORGET? quite lighthearted. The lights going out bit by bit at the end of WHAT DID THE LADY FORGET? were a particularly beautiful touch. Kurishima and Saito are excellent tentatively conveying their feelings for one another, and Kurishima's grin near the end is delightful. Kuwano is good as fiery Setsuko, although at times she's just as self-centered or petulant as the aunt who aggravates her. The conflict with her aunt seems to temper Setsuko's attitudes a bit, and she and the handsome Sano, as Okada, share a nice moment contemplating both lessons learned and the future before she takes the train home. One of the themes I'm always fascinated by in Ozu's films is the Westernization of Japan. Western furnishings were very prominent in FLAVOR OF GREEN TEA OVER RICE, but I was fascinated to see that perhaps even more strongly in a film of the '30s. There are nods to traditional Japanese design in the doctor's house but most of the home has very Western furniture and decor, including paintings and a grandfather clock. An issue of the New Yorker is seen in a magazine rack, and Setsuko reads about Marlene Dietrich. William Powell comes in for an admiring mention as well! WHAT DID THE LADY FORGET? was filmed in black and white by Yuhara Atsuta and Hideo Shigehara. As with all of Ozu's films, this was well worth watching, providing both entertainment and ideas to contemplate. I've yet to see an Ozu film I didn't like! Coincidentally, just this past weekend I saw WHAT DID THE LADY FORGET? too. I don't have Filmstruck, but it was on Youtube with English subtitles so that was my source. I thought the young girl who played Setsuko was quite cute, it's hard to believe if she were still alive she'd be 100 years old now! Time sure does fly. It was also kind of funny the way she kept trying to egg her fuddy-duddy Uncle to step out and have fun. It was a bit jarring near the end when the husband hits the wife after she yells at him too much. I also thought quite nice in the end when the husband explains how being in love with a woman and being married to her makes all the difference and why it isn't necessary to be going out for fun all the time. He learned a lesson and his wife learned not to be so hard. Even the cute Setsuko learned of her errors in almost ending a happy marriage. A very nice film. I still like Ozu's '50's and early '60's films much much better, but this was certainly worth watching and interesting to boot in seeing how Ozu developed his fiamily themes from the beginning. Also in the past month I've seen 2 other early Ozu films (thanks Youtube) Only Son (1936) and a silent film "Days Of Youth" ('29). Days of Youth was a bit long and I was surprised that it was basically an all out comedy, no family dramas here, even a little slapstick. I guess even Ozu gave a try at being Hal Roach. Only Son, however, was a drama and quite a sad sort of drama. A mother works hard to make enough money to send her son to college in Tokyo (I guess that was where successful Japanese folk went). Off he goes. Fade then to years later, the kid's now a poor teacher with a wife and a baby, his mother comes to visit and didn't even know he was married or had a kid. Well, just realized I was giving away some of the plot, so I won't give away the ending. Suffice it to say it was a very good film that really draws you in and you feel really involved with these sad characters. An excellent film, more in the style of Ozu's later films. Only Son's a must see, Days of Youth, ehh, if you want to watch a sort of silly comedy, go ahead. I really enjoy these Ozu films and can't believe a year or so ago I never heard of him. That was a rather shocking moment when he slapped her, especially by 2018 standards, but they handled it with a pretty light touch (no pun intended) and all that followed made it work OK dramatically. Thank you for the additional Ozu reviews! I own ONLY SON and hope I have time to see DAYS OF YOUTH this month (or I may resort to YouTube as well!). Like you I think my favorites overall are the color Ozu films, perhaps because that's how I was introduced to him -- although the exception that proves the rule might be EARLY SUMMER (1951), a B&W Ozu film which is probably my all-time favorite of his films seen to date. I first got to know Ozu films five years ago and like you, since then I've so appreciated the joy they've brought to my movie viewing -- it's really hard to believe I knew nothing about him for so many years. Trying to make up for lost time now!! 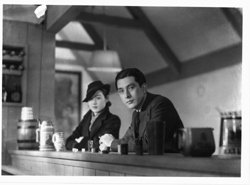 On Sunday (seems that's my Ozu night now) I watched another of his silents, I WAS BORN BUT. Though from the '30's Ozu still continued with making silents. I guess since I don't speak Japanese all Ozu movies are basicly like silents, in that you have to read them. This one reminded me a lot of his later "Good Morning" as it also involved a story of 2 boys in a family, getting into trouble, causing trouble and the general funny antics of kids, esp. boys and their bragging to each other over who has the best father, the best car, who's the richest etc. This movie was basically a comedy with many amusing scenes but not an all out comedy like DAYS OF YOUTH. It got relatively serious in the end when the boys were ashamed of their father when he acted a clown for the office boys at work. It was a nice little film that still taught a lesson about life and fathers being human. The mother in this one was sympathetic with both the father and the 2 boys. She seemed to be the one who kept peace in the family. An unusual story as are most all the Ozu films but certainly worth a look. Once again, not one of his best, but still memorable.